DPR Group Executives to Attend ProMat 2019 - DPR Group, Inc.
FREDERICK, Md. – DPR Group, Inc., a full-service public relations, marketing and communications agency serving a broad range of business and technology companies, announces its upcoming attendance at ProMat 2019 in Chicago. On April 8 and 9, DPR Group executives will be walking the exhibit floor to observe industry trends, experience the latest material handling and logistics technologies and network with the attending media to secure client coverage. Two of DPR Group’s clients will be exhibiting at the event. Cimcorp Automation Ltd. (Cimcorp) will be at booth S1218 demonstrating its automated systems for rapid, accurate order fulfillment. Westfalia Technologies Inc. (Westfalia) will be at booth S1247 highlighting its automation solutions, including its Savanna.NET® WES with FireFly fault recovery visualization. 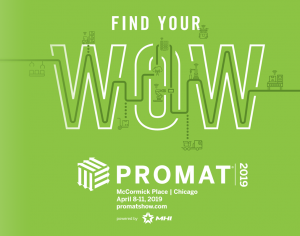 Powered by MHI, the nation’s largest material handling, logistics and supply chain association, ProMat 2019 is known as the largest North American expo and trade show for professionals working in the supply chain, warehouse and distribution industries. With 1,000 exhibitors from industry, commerce and government, the ProMat Conference will include over 130 sessions and bring together leading experts from the industry to give you the latest information on manufacturing and supply chain trends, technologies and innovations. The event is scheduled to take place from April 8-11, 2019 at the McCormick Place – located at 2301 S. Lake Shore Drive, Chicago, Illinois 60616. To schedule a meeting with an executive from DPR Group at ProMat 2019, contact Claire Kelly at 240-686-1000 or claire@dprgroup.com. DPR Group is a full-service agency that specializes in providing public relations, marketing and communications services to a broad range of business and technology companies. Founded in 1998, the firm has a proven track record representing both privately held and publicly traded companies in software and IT, manufacturing, clean tech, government contracting, supply chain and logistics, telecommunications, business consulting, and professional services. Headquartered near Washington, D.C., DPR Group has the experience and industry contacts to successfully launch new companies and products, as well as significantly increase the name recognition of larger, more established companies. For more information, call +1-240-686-1000, or visit: www.dprgroup.com.